Strong 4″ pipe base, heavy upright push bars, and 1 1/4″ pipe light loops. 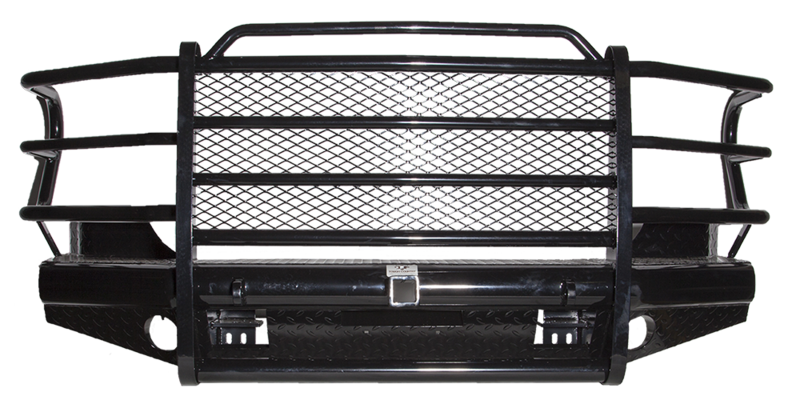 The Traditional Front Bumper has the same Tough Country strength and durability with a classic look. Remember our Custom Color Powder Coating! “…Same industrial strength powder coat finish as standard high gloss black finish with the added benefit of matching your vehicles color or giving you something truly unique…” Custom Colors Include: Black Wrinkle, White Gloss, Silver Vein, All King Ranch Ford Trim Colors, While Gold, & Matte Black. Our strongest and most durable coating.By upgrading with this option, a high pressure Bed-Liner Finish is sprayed on top of the standard industrial strength powder coat.